CO Detectors (also know as 'Carbon Monoxide Detectors') are electronic sensors that are designed to set off an alarm if they detect the presence of deadly carbon monoxide gas. 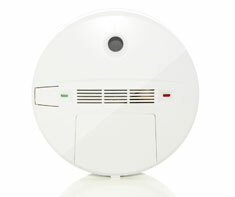 CO Detectors are an especially important safety feature for a home that has any type of fuel-burning appliances. Accidental carbon monoxide (CO) poisoning kill more people than any other chemical substance (200 people killed and 8,000 people injured per year) according to the Consumer Products Safety Commission. Carbon monoxide is an odorless, colorless gas that is created by combustion such as in a gas furnace or oil-fired water heater, gas oven, or engine. During winter when doors and windows are closed, and heaters and furnaces are operating, the potential for carbon monoxide poisoning dramatically increases. Fireplace (wood-burning), Furnace (gas), Fireplace (gas), Smoke Detectors, Water Heater (gas), Water Heater (oil) and Wood Stove. Shown in the 'Routine Care' section are the recommended routine maintenance tasks for your co detectors. The 'Q & A' section shows answers to common questions. And the 'Articles' section provides helpful articles about your co detectors.